March 18, 2019 - Registration for the 2019 Leadership Institute is now open! 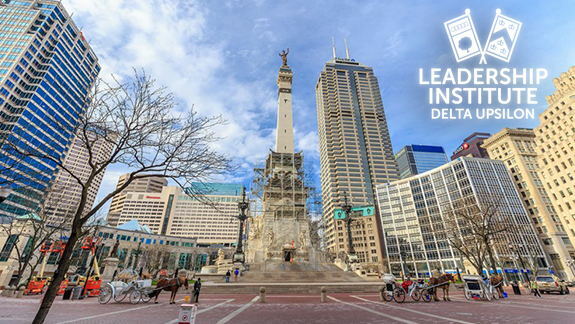 Join Delta Upsilon July 25-28 at the Hyatt Regency Downtown in Indianapolis. Priority registration ends June 15, with prices increasing by $50 after that date. The Leadership Institute serves as DU's annual convention and is the Fraternity's largest gathering of the year. Nearly 400 undergraduates and alumni will gather for a weekend of brotherhood, award recognition, networking and educational programming. LI is also where official business of the Fraternity is conducted. At LI, undergraduate and alumni members both participate in a legislative meetings. Attendees will also have the opportunity to visit Delta Upsilon's International Headquarters. Each undergraduate chapter/colony receives two complimentary registrations to LI, but it is encouraged that eight chapter/colony members attend. Chapters should determine which members will receive their those registrations prior to the end of the academic year. Full- and part-time registrations are available for alumni members and guests. Alumni serving as advisors or alumni chapter/association officers are encouraged to attend the educational programming tracks geared toward alumni. For questions about the Leadership Institute, contact Director of Educational Programs Veronica Moore at moore@deltau.org.